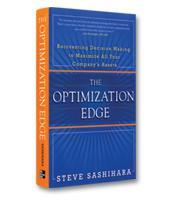 Steve Sashihara's latest book offers a groundbreaking approach to decision making. Using the newest advances in mathematics and computer software, companies can fully maximize their assets at every decision point. The Optimization Edge quickly introduces readers to this strategy in clear, nontechnical terms, with examples from the trenches. In 2008, UPS wanted to increase the fuel efficiency of its 88,000 delivery trucks. With such a large fleet, even an incremental increase in fuel efficiency would result in major savings for the company. One efficiency problem that UPS discovered was the amount of time the trucks idled while waiting to make left-hand turns. Using special optimization routing software, UPS was able to redraw its delivery routes to favor right-hand turns. As author Steve Sashihara writes in The Optimization Edge: Reinventing Decision Making to Maximize All Your Company’s Assets, "In 2005, the software helped UPS eliminate 464,000 driving miles in Washington, D.C., alone, saving 51,000 gallons of fuel." UPS is just one of many winning companies, writes Sashihara, that illustrate the power of what he calls optimization, which he defines as "a decision-making process and a set of related tools that employ mathematics, algorithms and computer software not only to sort and organize data, but to use that data to make recommendations faster and better than humans can." Optimization, he writes, allows companies to "squeeze every ounce of value" from their assets. McDonald’s is a classic example of optimization at work. Every micro-decision — when to turn hamburgers or dump old coffee — has been carefully thought through and translated into rules. Amazon is another example. When it first opened for business, Amazon shipped so few items per day that employees rang a small bell to celebrate each sale. By December 2008, Amazon was shipping 72.9 items per second. What are my company’s underutilized assets? For example, train capacity for a railroad or the face time that a pharmaceutical company’s sales reps spend with doctors might be optimized to bring greater value for the company. Where and how are repetitive decisions about key assets being made in my company? Improving the accuracy of those decisions by even 10 percent could have a major impact on profitability. Sashihara emphasizes that optimization projects are not just another IT project, as some who are unfamiliar with optimization might argue. IT projects are usually the technological implementation of a detailed project plan. Optimization involves continuous research and development. The optimization of a decision must be tested and evaluated. Is the decision being made faster and better? When described in such theoretical terms, optimization may seem simple: Do the math. Nike’s experience offers an example of the real-world challenge of optimization. In 1999, Nike embarked on an ambitious optimization program to quicken its response to shifting market demands. If one style of shoe became more popular and another style less popular, Nike wanted its worldwide production schedules to shift accordingly within one week. The standard time to change production schedules was one month. After two years of optimization work, in partnership with a leading optimization software vendor, Nike’s production schedules were in turmoil. Models high in demand were in short supply. Nike blamed the vendor, the vendor blamed Nike. Either way, the lesson is clear: Optimization is not as simple as doing the math. Sashihara explains the 5-step methodology for optimization — from selecting and designing the project to leveraging the benefits — used by his consulting company. 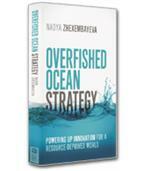 Clearly, however, optimization cannot be implemented from a book. The value of The Optimization Edge is to introduce executives, through scores of specific examples and in clear and concise prose, to the potential of optimization to reallocate resources and make the most of their companies’ assets.